Empowerment Conference 2017: Women Who Win! Empowerment Conference 2016: Great Expectations! Empowerment Conference 2019: Brave New World for Women! Empowerment Conference 2018: Right Time, Right Now! TLAW was born out of the efforts and enthusiasm of women who participated in a judicial selection seminar in 1988. At that time, there were six existing organizations for women attorneys throughout the state, but no statewide group existed. 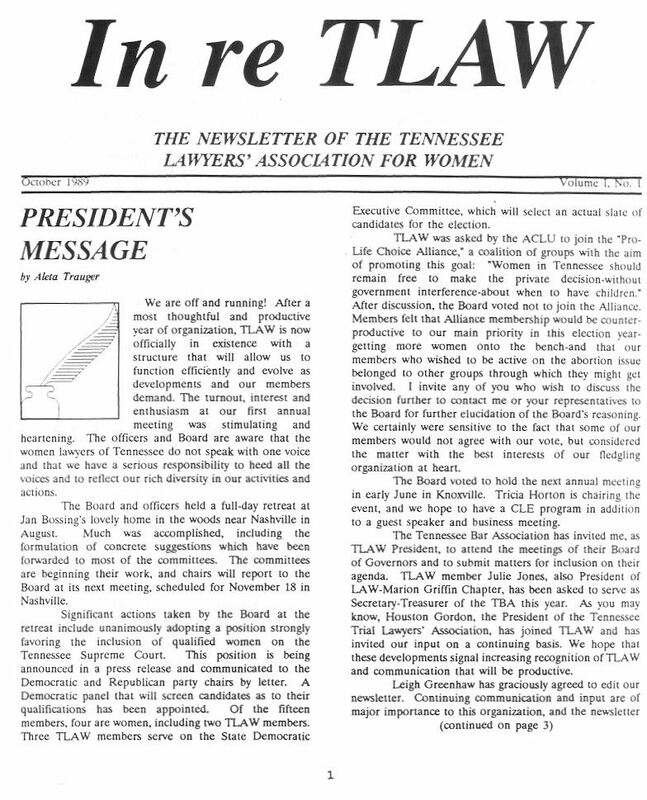 The then-existing organizations included the Female Attorneys of the Mountain Empire; East Tennessee Lawyers’ Association for Women; Lawyers’ Association for Women, Marion Griffin Chapter; Lawyers’ Association for Women, Upper East Cumberland Chapter; The Association for Women Attorneys Memphis; and Jackson Women Lawyers. 1. To maximize and increase our political strength and influence in order to increase the number of women serving on the bench. 2. To improve the visibility and image of women attorneys with members of the public, the government, and our own profession. 3. To share information between groups and individuals throughout the state through a newsletter and other means. 4. To provide for professional advancement through the sharing of information concerning employment opportunities and to facilitate client referrals. 5. To provide mutual support and fellowship. professors, new lawyers, and minority lawyers. 7. To encourage the development of organizations of and for women lawyers in those parts of the state where they do not exist. 8. To provide education on issues affecting women attorneys and on legal issues affecting all women. 9. To increase the awareness and involvement of members of the judiciary in our organizations and on issues affecting women. 10. To provide a source for continuing education. 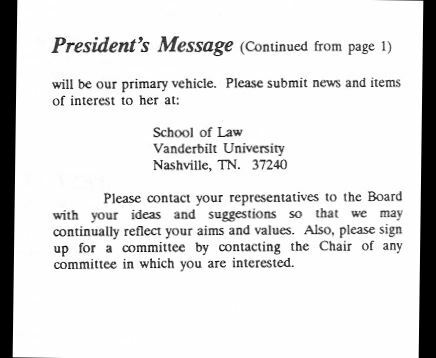 Soon afterward, an initial board was created comprised of persons from the six existing organizations, and Judge Julia S. Gibbons served as the first President of TLAW. The board worked on developing the structure of the organization over the next several months. The priorities set by the board would later evolve, in modified form, into the Purposes of TLAW. You can see a photo on one of TLAW's first boards here and you can read an excerpt from TLAW's very first newsletter here (page 1) and here (continued). 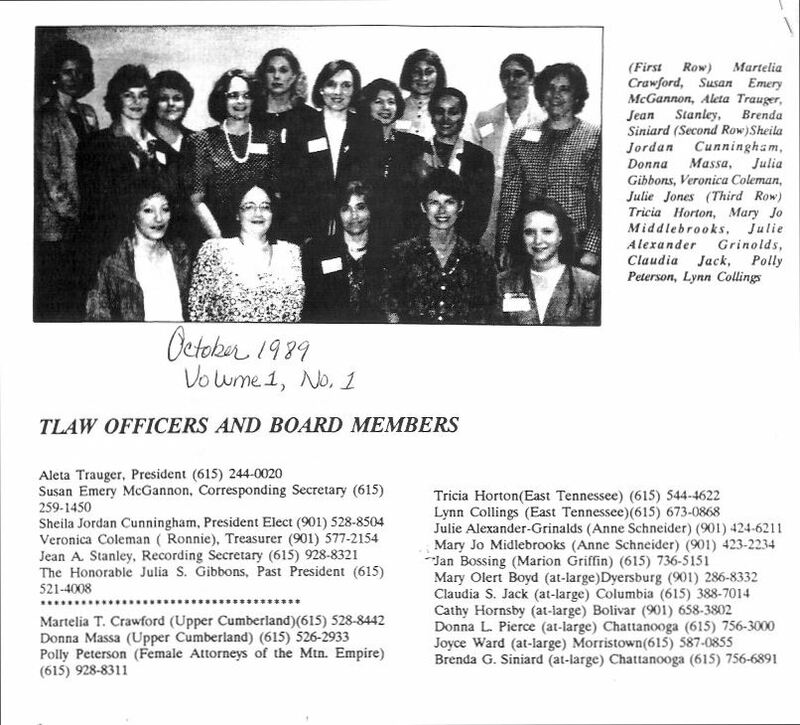 Some of the other women who were instrumental in the formation of TLAW or who served as officers for TLAW in its early days include Judge Martha Craig Daughtrey, Judge Aleta Arthur Trauger, Justice Janice M. Holder, Judge Marietta Shipley, Sheila Jordan Cunningham, Susan Emery McGannon, Jean A. Stanley, Veronica Coleman, Martelia T. Crawford, Donna Massa, Polly Peterson, Lynn Peterson Collings, Tricia Horton, Julie Alexander Grinalds, Mary Jo Middlebrooks, Janice H. Bossing, Mary Olert Boyd, Claudia S. Jack, Cathy Hornsby, Donna L. Pierce, Joyce Ward, Brenda G. Siniard, Ellen Vergos, Katie Edge, Nora McCarthy, Jane L. Davis, Elizabeth Tonkin, Barbara Gillespie Medley, Martha Brasfield, Linda Walls Holmes, Patty Parnell, Beth Stricklin Bates, Dot Dobbins, Sue N. Puckett-Jernigan, and Nancy Preslar. Over the last twenty-plus years, TLAW has experienced growth and has facilitated the actualization of many of the priorities envisioned by the initial board so long ago. Despite the passage of time and our accomplishments as an organization and as individuals, our purposes and goals remain the same. future success of the organization. You can join TLAW here. Copyright 2018 Tennessee Lawyers' Association for Women. All rights reserved.